Ken Jenson, owner of Amada Senior Care Denver, knows that delivering excellent quality care for senior clients is just part of the job for him and his team. A close second in priority to providing the best care is giving dedicated support to seniors’ families. Being a devoted family man, Ken believes that senior care—like everything else in life—should be a family endeavor. Ken and his team’s commitment to caring for seniors and their families has earned Amada Senior Care Denver its reputation for providing superior senior care to families in Denver, Centennial, Lakewood, Littleton, Highlands Ranch, Englewood, Aurora, Parker, Castle Rock, Denver, Arapahoe, Douglas, Jefferson and other area communities, cities and counties. Every member of Ken’s team offers specific knowledge, specialized training and deep-rooted experience in various aspects of senior care. Danny Jenson, office manager and Ken’s son, holds a bachelor’s of science in neuroscience from Brigham Young University and a doctorate in neuroscience from Baylor College of Medicine, with learning and memory being his area of emphasis. Michelle Barrett, who handles caregiver scheduling is a CNA with many years of experience in senior care. Natalia Rivera, who handles HR and caregiver recruitment, was a caregiver to her grandmother for three years. The goal at Amada Denver is to not only meet all of a family’s senior care needs but also exceed their expectations of care. If we have been brought in to provide in-home care for a senior, we go beyond activities of daily living (preparing meals, housekeeping or shopping) because we want to enrich our client’s life in the most meaningful ways possible. For example, discussing a favorite scripture would bring peace of mind to Aunt Beth, or having someone bake his favorite cookies would delight Dad, or helping tidy her prized rose garden would thrill Grandma Jo. Adding personal touches to the care we provide allows us to show our senior clients just how much we truly value them while we work to vastly improve the quality of their lives. At Amada Denver, we have learned through personal and professional experiences that the loved ones of senior care clients are often overlooked. We know how stressful and overwhelming it can feel to try to ensure the best care for a loved one who struggles due to his or her age. We believe that if we are to properly honor our calling to provide the best senior care possible, we must make sure that a senior client’s loved ones feel encouraged and supported throughout their senior care journey. If you or a loved one in the Denver area could benefit from assistance with activities of daily living such as those depicted above, please don’t hesitate to contact Amada Senior Care. You will immediately be connected with a member of our team who has extensive local experience in senior care so that your family’s unique needs can be addressed with a customized plan of care. At Amada Senior Care Denver, we are committed to providing your loved one with the highest quality of personalized and compassionate senior care available anywhere. Furthermore, we will support you and your family members throughout your senior care experiences so that you will feel confident you have explored all of your options and made the wisest decisions for the ones you love. At Amada Senior Care Denver, we know that a the physical well-being of a senior loved one cannot be the sole focus of a family considering the transition to assisted living. We understand that other factors, such as a senior’s quality and enjoyment of life, proximity to family, and the cost of senior housing must also play a role in the placement process to ensure the ideal solution for each senior’s unique situation. This is something we have guided countless seniors and their families through, and it would be our pleasure to assist you and your loved ones as you weigh all of your senior housing options. There are so many wonderful senior communities in the Denver area, but this benefit can easily seem like a burden if a family doesn’t know how to identify the right place for their loved one. We suggest breaking the search down based on three main categories: physical care, emotional well-being, and cost. While adequate physical and medical care is essential to a senior’s safety and comfort, it is only by meeting their emotional needs that we help them to thrive in their new homes. We at Amada have working relationships with nearly every senior community in the Denver area, and we can direct you and your loved one to the one most in line with his or her personal needs and preferences. We will consider factors such as a home’s location, physical environment, social offerings and lifestyle, and more so you can feel confident the senior in your life will feel happy and fulfilled. At Amada Denver, we strive to find the ideal senior care solution for each family—and if that solution doesn’t exist, we’ll create it. With this in mind, one of the ways we have revolutionized senior care options is through our development of our remote care technology, the BeClose home monitoring system. At Amada Senior Care Denver, it is our goal to dramatically reduce or even eliminate each family’s senior care costs. We do this by helping them take advantage of resources such as government programs and other forms of financial aid, which are especially plentiful for veterans. 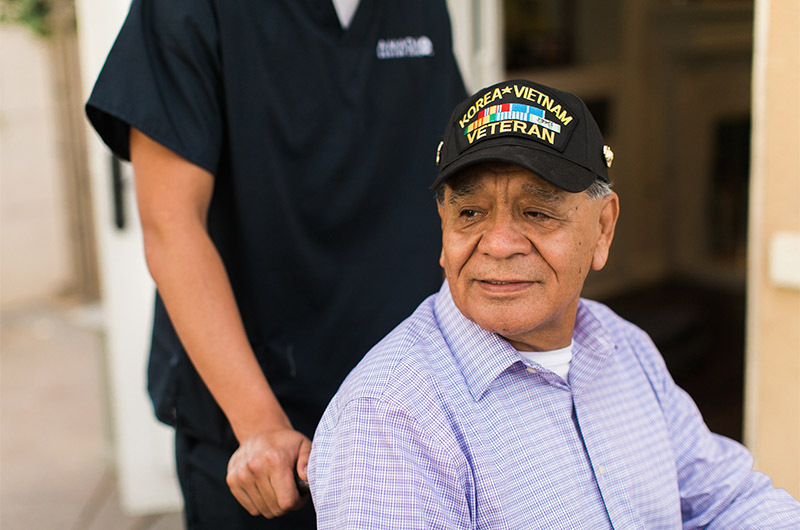 Many of the veterans we work with are not aware of benefits such as the VA Aid and Attendance program, which provides monthly assistance to wartime veterans and surviving spouses to pay for help with activities of daily living. To learn more about this and other senior care benefits specifically for veterans, please Click here for a Free Veteran’s Care Needs Consultation.